This page provides access to educational programs. Supermarket Botany is an excellent platform for teaching students about the differences between fruits and vegetables, between roots, stems and leaves and the developmental sequence from flowers to fruits. Drs Geoff Burrows and John Harper selected items for 'the shelf' and accompanying text. Ms Jenni Horsnell took the fruit and vegetable images on the 'on the shelf' page. Dr Geoff Burrows took the images on the 'Why?' pages. Prof Scott Black performed the ToolBook programming and web page design. This application only works with Windows Internet Explorer 6 and above and Firefox 3.0 or above (both Windows and Mac OSX). It does not function with other browsers. Survey table (pdf) - This file includes the 'standard' survey form and a simplified version for younger students. Teachers may like to survey their class before doing a hands-on or computer-based Supermarket Botany demonstration, and then re-survey a few days or weeks later to assess what has been learnt. Species table (pdf) - This table is designed for senior high school and university students. It facilitates discussion of scientific naming, authority citations, taxonomic relationships, differences between monocotyledons and dicotyledons and more. A description of Supermarket Botany appeared in the June 2009 issue of Teaching Science (citation: Burrows, G. E. and Harper, J. D. I. 2009. Supermarket Botany. Teaching Science 55(2): 47-50). A recent survey by the EverCrop™ project indicates that 83% of farmers within the mixed farming zone of southern NSW, regularly under-sow their pastures. In other words they use a cover crop. This practice goes against traditional research and extension advice which recommends pastures to be sown without a cover crop (straight sown), because under-sown pasture is at greater risk of poor establishment and less productive over the pasture phase. However, most previous research focused primarily on pasture density and biomass production. It did not quantify the financial implications of the cover crop or the potential effect on livestock productivity. 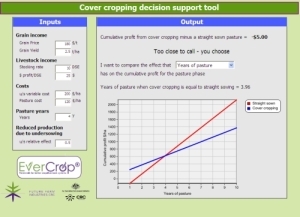 The Decision Support Tool operates under the premise that a pasture is to be sown in a particular paddock the next year. The user is able to consider the costs and income from grain and livestock production during the pasture phase. An important component of the model is the capacity for the user to change a range of inputs to match their enterprise. The inputs in the Decision Support Tool include expected grain price, grain yield, stocking rate and livestock gross margin ($/DSE), establishment costs, the length of the pasture phase and relative effect that under-sowing has on pasture production (Figure 1). To view details about the tool, please here [PDF].